Macedonian Kingdom, Alexander the Great, 336 to 323 BC. 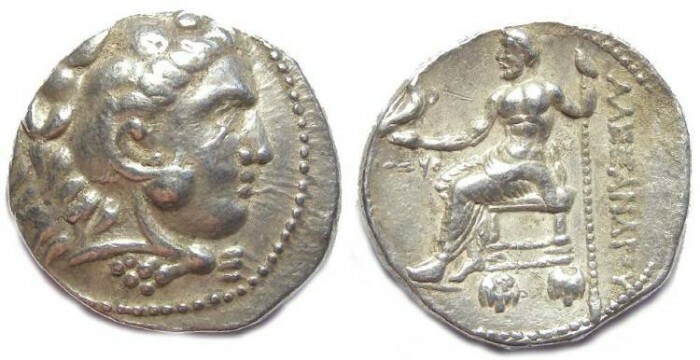 Silver dated tetradrachm from Ake. Date : Phoenician year-31 (317 to 316 BC), struck posthumously after Alexander's death. Size : 25.5 x 26.9 mm. Weight : 17.06 grams. Grade : VF. There is a small old scratch by the eagles head. Reverse : Zeus seated left, holding a sceptre and eagle, with ALEXANDROU to the right, the mint mark "YO" and a date mark in Phoenician numerals for Year-31 below his arm. The Ake mint Alexander tetradrachma are very interested as they actually have dates on them, in a Phoenician dating system.